Major renovation completed in 2015. New furniture, appliances and TVs. New Hot Tub installed winter 2016. Welcome to fantastic Lake Tahoe. Our home is a comfortable large 4000+ square foot creekside lodge style residence on a spacious 1/2 acre lot that backs up to parkland with a year round creek running through it! You'll enjoy the amenities which include state-of-the-art wireless internet, 3 flat screen TVs with HD cable. The home is low elevation and is very close to town and the beaches (3 minutes). It is very family friendly and easily accommodates larger groups and multiple family gatherings. It backs up to parkland, has a year-round creek and has lots of privacy. In the winter it is one of the first streets to be cleared of snow by the city so you are ready to hit the slopes early. We also employ a snow clearing service to clear the driveway, walkways and parking pad. You and your family and friends can enjoy meals on the balconies while looking at the towering pines and listening to the comforting sounds of the rushing creek. You can choose a picnic down by the creek with friends and family, enjoy the solitude with a glass of wine and a loved one, or just sit alone with your thoughts. This environment is guaranteed to restore your soul. Our house is on 3 levels, has 4 bedrooms and a loft area. The first level bedroom is actually an attached apartment/game room with fireplace, bathroom, kitchen and a sun room; perfect for a separate family or a place for teenagers to help maintain a level of separation. This room is set up like a family room and sleeps 5+. It has its own flat screen TV and HD cable newly remodeled bathroom and separate entrance. Loft - Queen Sized sleeper sofa & 6 foot couch sleeps 2-3. Library - Single sleeper couch - Sleeps 1. ALL FURNITURE, MATTRESSES, LINENS, DISHWARE, UTENSILS,TVs AND BEDDING ARE NEW. ALSO, WE HAVE JUST INSTALLED A NEW HOT TUB. Our house has a fully stocked kitchen with a breakfast bar, a formal dining room with a view of the creek, and a spacious living room with a wood burning fireplace and 20 foot pine covered ceilings. We have quality furniture throughout the house. There 3 new flat screens. There is HD cable TV and a state-of-the-art wireless internet connection for fast and dependable far reaching connections from all rooms and even at the creek!. There is a large mud room as you enter the house off the garage that can accommodate over 12 sets of skis, boots, jackets and snow boards. We also have a laundry room with a brand new washer and dryer. There is a 2 car garage and a huge parking pad that can easily accommodate an RV, a boat trailer, snowmobiles, and several cars. We often bring our sons, family members and friends to relax and take in all of Lake Tahoe's splendor. We have great memories and we know you will create them, too, in our comfortable home. At the house we supply a full booklet on restaurants, maps, recommendations, and instructions on many of Lake Tahoe’s offerings. We know you will find this helpful in maximizing your time at our home. We also supply all dishes, silverware, linens, coffee maker, etc. This is a non smoking home. We will not rent to vacationing students or singles under 25 years of age unless accompanied by an adult guardian or parent. This is the way we maintain our standard of excellence and comfort for our friends and guests. Incline has three private beaches for your enjoyment. In the Spring and Summer months you can hike, swim in the lake at it's private beaches(3 minutes), raft on the Truckee River, shop, gamble at the Hyatt (5 minutes), or take in the gaming life in the South Shore Casinos or Downtown Reno (both about 35 minutes away). During the Fall and Winter months you can add all the great winter activities Lake Tahoe has become famous for, including world class ski resorts, all a short driving distance from our home. A private chef is available upon request. Please call for pricing. We have supplied lots of photos of our home for your viewing. We know you will love it as much as we do! We truly believe the North Shore of the lake, and Incline Village in particular, is one of the most beautiful places in the world. Incline Village is preferable to the rest of the lake because it's proximity to Reno and the Reno/Tahoe airport (35 minutes) and it's central position to all the great ski and recreation resorts. From our house you're never more than 35 minutes from either Squaw Valley or Heavenly Valley, less than 20 minutes to Northstar and the awesome town of Truckee is about 25 minutes. You are less than 20 minutes to Mt. Rose resort and less than 8 minutes from Incline's own Diamond Peak ski resort! Mark Twain once describing Lake Tahoe said, 'I thought it must be the fairest picture the whole earth affords' and the Indians referred to it as 'big sky lake'. Lake Tahoe is best known for its beautiful blue and clear water (99% pure), and is surrounded by mountains which rise more than 4,000 feet above the shore. The lake is 22 miles long, 12 miles wide; about one-third lies in Nevada, the rest in California. Elevation at the lake is 6,229 feet. A Washoe County Rental Tax of 13% is required for all reservations. My wife and I have been married for almost 24 years and we have 2 boys who love to snowboard. We live in the Los Angeles community of Palos Verdes Estates. After much research we chose Incline Village because of it's great reputation, it's close proximity to the Reno airport and it's centrality to all the great attractions that Lake Tahoe's has to offer. This is a 2nd home for us and we enjoy sharing it with friends, family members and our guests who appreciate both Incline Village in particular and Lake Tahoe in general. After many months of extensive renovation we have reopened our home in 2014. My wife grew up in the Bay area and due to her familiarity with Lake Tahoe we started coming here since we got married in 1990. Because I am a Southern California native I was used to going to Mammoth. We have always wanted to buy a 2nd home here and in 2005 finally decided it was time. We are so glad we purchased a home in Incline Village. It is central to all parts of the lake and is the closest Tahoe community to the Reno airport. It also has the private beaches and golf courses that we and our guests can enjoy. Most importantly, it is quiet and serene. Our desire is to share it with guests, family and friends and have the home as a legacy to pass to our children and (eventual) grandchildren. The location is serene yet close to everything. We can hang out at the house all day and read and listen to the sounds of the creek. In just a few minutes we can be at one of the great local restaurants or private beaches. In 20 minutes we can be in Northstar or Truckee, 40 minutes to Heavenly or Squaw Valley. All bathrooms have new stone flooring. Year round creek and towering pine trees. Backs up to parkland. 2 minute drive to Lake Tahoe. Large 2 car garage with direct access to house. Insulated new garage doors. Living room has 2 level ceiling and glass windows. 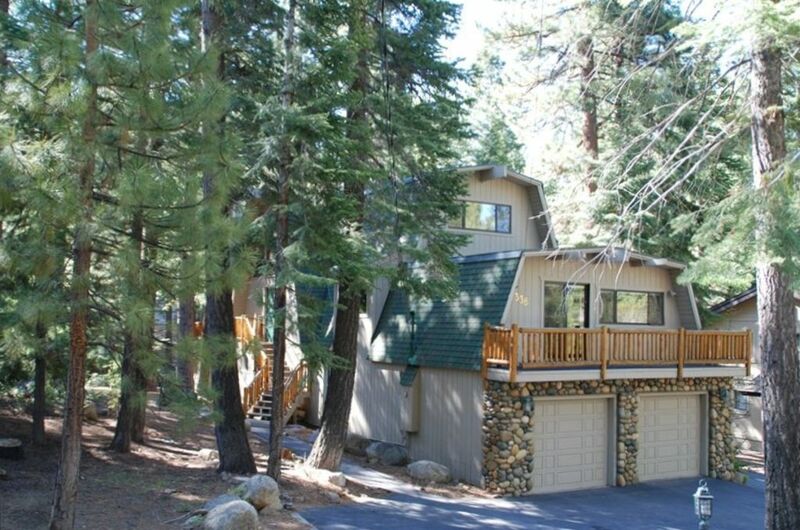 Looks out to attached balcony, huge pine trees and our year-round creek. Collection of DVDs for our guests. Large balcony off living and 1 bedroom. Decking around the house. Diamond Peak ski resort in town. Squaw Valley, Heavenly Valley, Northstar, Mount Rose and more within driving distance. Several golf courses in the immediate area. Very large place; met our expectations for sure. Some of the instructions were somewhat confusing (e.g. some of the doorcodes etc I think were referencing an old setup, before they were updated, and had to figure out that the wifi password should actually be lowercase), but all minor. The owner Gerard was helpful and communicative. Loved the layout which fit our 5 couples plus one three year old perfectly! Loved the hot tub and the ping pong (even in the cold !) was fun! Kitchen could be bigger and upgraded but was well stocked for cooking big meals - which counts for everything! Great bedding and loved the wood burning fireplace. Super pre- Christmas holiday with a day of great skiing at Diamond Peak! We will return. We had wonderful time at the cabin. It was clean and organized and all our guests had a nice room to stay. Easy access to get in. The space was bigger than expected. Otherwise a great rental for my friends and I. 1 1/2 miles from Burnt Cedar Beach, one of Inclines 2 private beaches. Our place is 2 1/2 miles from the Hyatt Regency with its restaurants and great casino. We are located about 20 minutes from Northstar ski resort, 20 minutes from the town of Truckee and 20 minutes from the Mt. Rose ski resort. We are approximately 8 minutes from Incline's own Diamond Peak ski resort. The Casinos at South Lake Tahoe and the ski resort at Heavenly Valley are a beautiful 23 miles drive and Squaw Valley ski resort is an equally breathtaking 19 mile drive. Holiday Rates are $595 per night. These include New Years, Easter/Spring Break (3/22-4/4), Independence Week (7/1-7/7), Memorial Weekend, Labor Day Weekend, Thanksgiving Week & Christmas Week.